Tan Family Chronicles: Boring, Still Must Write! If you guys have been faithfully reading my blog, you would know that Isaac, my 6 going on 7 year old, can write pretty well - for his age, at least. You would have seen his writing here, here and here. So, yes, he can write pretty competently. Thus, it has been very frustrating for me, when I noticed that his recent writing for his school journal assignments have been very badly written. I have had quite a few quarrels with Isaac lately because of this. Generally we start quarreling when I want him to rewrite or amend or expand, and he is unwilling to do so. What frustrates me, is NOT that he does not churn out grade A work, but that he is obviously not trying. No effort. - What I did during Chinese New Year. For basically what Isaac would do, is that he'd simply reply the question point blank, or list down what he did that day and he says he is done. We have had to give him hints and teach him on how to expand and write more about the subject topic in order to prompt him on. So far, we have let him slide so long as he does a passable job, but I wish he did try harder. For himself. For we would ask him "Are you proud that you wrote this? Are you happy to announce to the world that this is written by you?" He would look away and not meet our eyes, in shame. Then he would grudgingly say "Alright! Alright! I'd do it again!" Isaac generally enjoys writing... but I guess it is difficult when topics are uninspiring! On a more constructive note, I decided to brainstorm and think of ways which I can suggest to Isaac, to help him write better, for his journal entries for his school journal, despite the B topics. Oh, why do I ban the word "boring"? Coz I always tell the kids "Don't let me hear you say something is boring. Don't ever say that. Since you know it is boring, then you should find something or some way to make it more interesting! Don't just complain and whine that it is boring! That does nothing to help the boring situation at all. Instead, think of something you can do to make things more fun and interesting. Say "why don't we do this ____ instead? That would make it more interesting!" And be open to suggestions!! !No saying "Boring!"" Okay, so maybe the kids abide by my rules not to say the B word just so they don't have to hear that entire monologue, but I say it anyway! Hah! Idea #1: Pick one funny or happy moment during that day that you were told to write about and expand on that. Idea #2: Think of a funny story that is related to the subject topic and say that. (Though there is a danger of going off topic with this method"
Of the three ideas I gave him, he frowned at me for the first two and said of the third, wide-eyed "Can draw ah? Later teacher scold." To which I hesitated for a split second before saying:"I think it should be fine to draw in your journal, but you STILL MUST WRITE." He rolled his eyes and sighed. So you can imagine my relief when I got an email from Monsters Under the Bed inviting me and my readers to a free writing clinic entitled How Your Child Can Be a Better Writer! Wow, what great timing! I'm going for this talk for sure! Monsters Under the Bed are the good people behind the very fun writing camp - EnchantInk - Isaac went to in March. 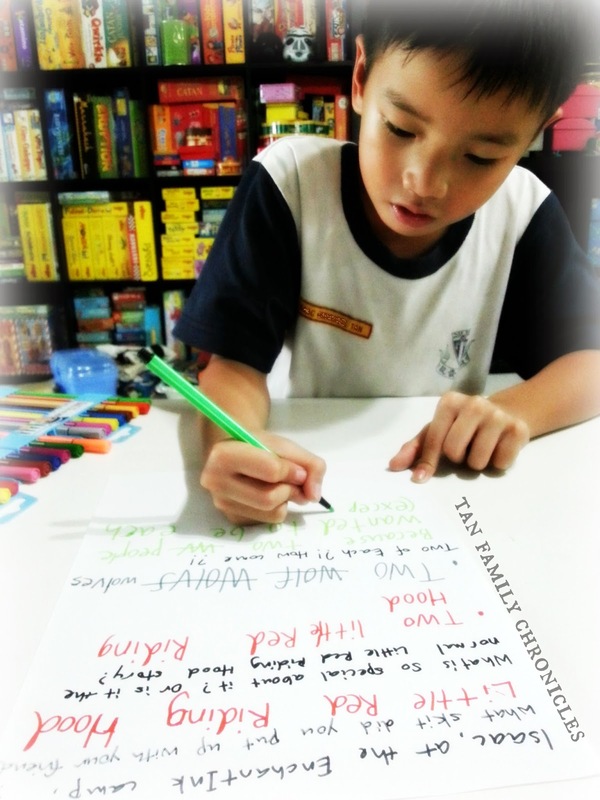 The writing clinic is meant for their existing students' parents, as well as their upcoming June camp MonsterHuntInk parents, as well as... Tan Family Chronicle readers! All you have to do is to register for the talk at this link. And it's not just a writing clinic for the parents, you can bring your children along too if you want the trainers do an assessment for the kids. While you are listening to the talk, your children will be in the next room with the trainers who will assess your child, to explore their writing weaknesses and let them know what they can do to improve, as well as recommend books for them to read. Read more about this event at the registration link too. Places are limited, so be sure to sign up asap! I have already reverted with my RSVP and we'd be there for this talk this Sunday. I hope the talk is as interesting as their EnchantInk camp was, and I hope that the MonsterHuntInk camp Isaac is attending in the first week of June will be as fun as it sounds too! We understand that there are still a handful of places left for this camp for 7 - 12 year olds - sign up and we can see you at the camp too! Hunting Monsters sound like such fun! Wish we had such camps too when we were young!